Fighting General Daimos (闘将ダイモス Toushou Daimos) was an anime produced by Nihon Sunrise and it ran from 1st April 1978 to 27th January 1979. It consisted of 44 episodes. It is the third installement of Tadao Nagahama's Romantic Trilogy. 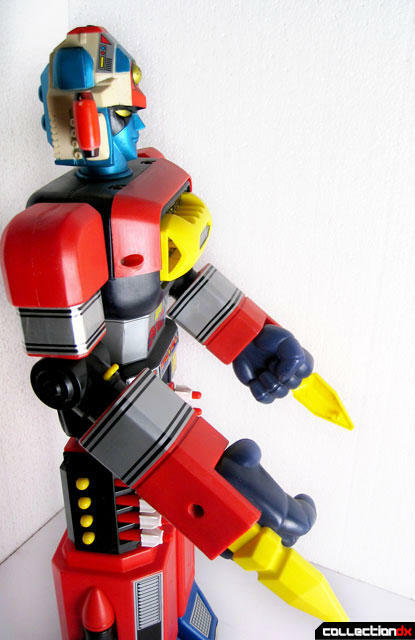 Chodenji Robo Combattler V was the first and Chodenji Machine Voltes V the second. Both were also released as Machinders by Popy. It looks like the name of Daimos comes from Deimos, one of the two moons of Mars. A lot of people know this character from the Shogun Warrior line, released by Mattel, but the version we know is clearly a downgrade of a perfect toy. The original version is probably one of my favorite Machinder, stuffed with a ton of accessories and great attention to details. He can shoot from all sides and slice you with a huge choice of blades. Popy's Machinders usually come with no shooting fist or both shootable. In this case you will enjoy the two shooting fists, and the articulation at the elbow. Unlike the Mattel version, both forearms are red and his right hand is designed to be able to grab the handle for the blades. The handle is the yellow part on the chest which is removable. Once removed, you can put two blue blades in it. 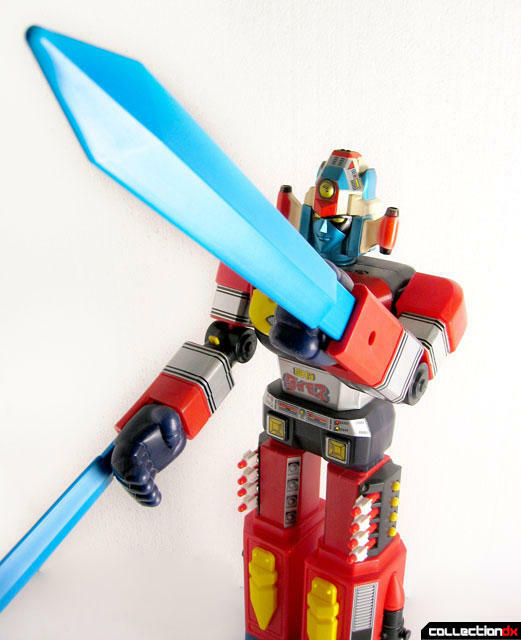 It comes with another pair of huge blue blades that can fit in the forearms. At this place you can also put the little yellow blades that are placed on the legs. 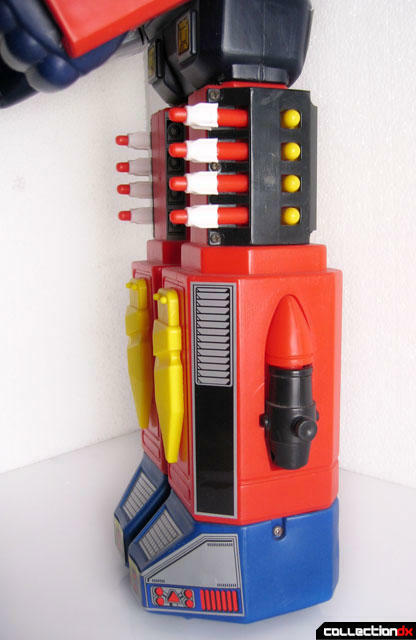 When it comes to the missiles, Daimos also features a big launcher for red missiles, those where designed specifically for this machinder. He also have on the side of each upper leg part 4 missiles launcher for regular popy missiles. 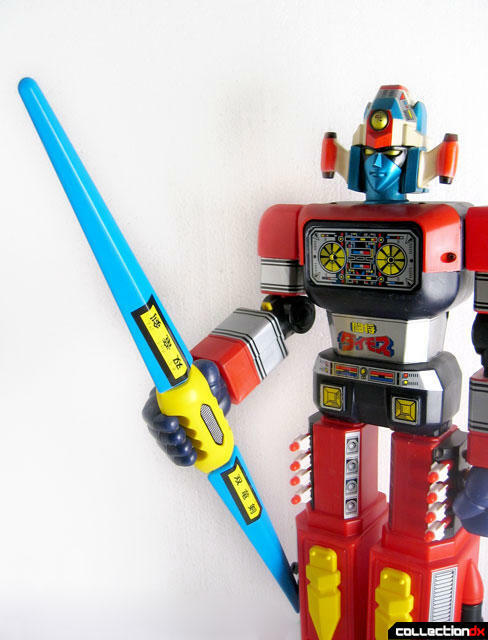 He shares almost all the same features as the Godaikin except that he doesn't transform into the tank. Too bad Popy didn't do it as they've done it for both Voltes V and Combattler V. Well you can still pretend it does as there's some shapes molded on the back of the main body part that look like wheels but this doesn't make a real tank mode. So from all those accessories, Mattel only kept the missile launcher on the lower part of the legs and one shooting fist. Some pieces where replaced by stickers and they didn't even put as many stickers as were on the original. The Japanese version exists with two different stickers on the belt, one with the Japanese calligraphy and the other one with 'œDAIMOS'? written on it. I think that the second version is rarer but this is just from what I saw during the years. This Machinder is quite difficult to find complete, but strangely I've see more boxed specimen than loose ones. The one I own has a repro box so maybe this is the reason why I had a good deal on it. Be prepared to spend if you want to add this machinder to your collection, but I guarantee you won't regret it! Would have been nice if it has a SoC version, die cast and all. anyway, it would be definitely worth the wait. This guy looks completely incredible. I love what they did with the arm blades. I only wish that mattel had retained popy's ambition and artistic conscience. Yes, I consider banks of launching plastic missiles to be an act of artistic conscience. I was never aware of the Popy version's subtleties until today. 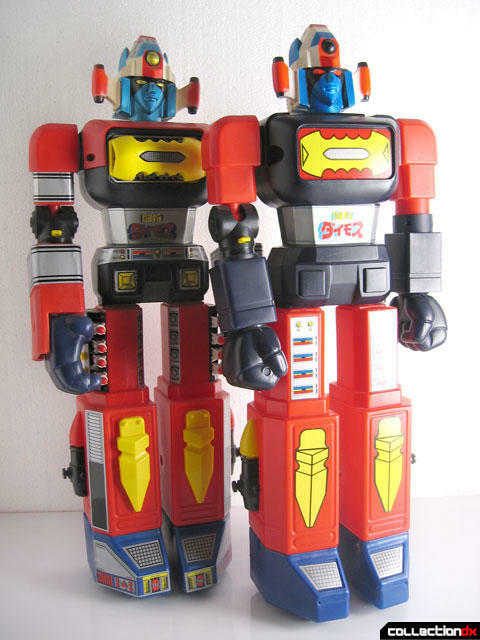 I had always frowned upon Daimos as a machinder because I was only vaguely familiar with the mattel version, which did not have arms that could accommodate the Popy arm accessories. I looked at him only as fodder for customization, and not as a whole piece. This changed when I saw the mattel version at a flea market a few weeks ago. I was blown away by his coolness, even though he was a beaten down, caveman-like dumbing down of a masterpiece. Today I saw a YHJ auction for the real deal, with swords. 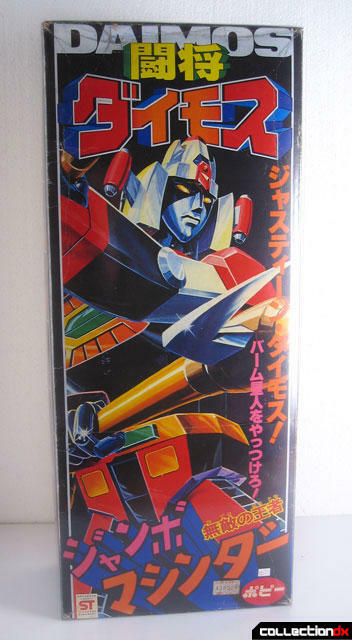 I had to go looking for pictures of Daimos with these blades, because I didn't even know if he came with them. Which led me here.